OpenID allows you to sign-in to different web services which support OpenID with out registering at each and every site. The OpenID concept is very useful for the end users, although several sites are supporting this but the majority are not yet providing OpenID support. Popular services like Blogger and Yahoo and many others allow you to use your profiles as OpenIDs across the web. Other than OpenID there are similar services, for example Facebook connect and OAuth. Google is unifying various Google services with Google Profiles. 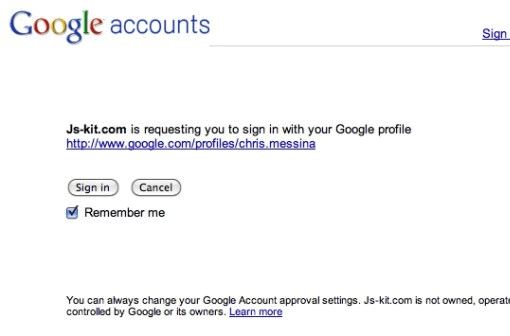 Sometime back Google allowed users to use vanity URLs for their profile pages. Google Profiles can now be used as OpenID according to this tweet from Brad Fitzpatrick. That means you can now use your Google Profile to confirm your identity to any web service that supports OpenID. OpenID foundation member Chris Messina posted a screenshot of how it works when you login in with Google Profile to any website. The above tweet by Brad also hints about Webfinger, a protocol Google is building into its Gmail. Webfinger allows web users to attach public metadata to their email addresses.